A Saturday on the beach. Teva x JammyPack fanny pack and sandals. Minkpink bikini. Paige shortalls. Crap sunglasses. This past weekend was glorious and sunny; a great welcome to long summer days ahead after springing the clock forward. I took full advantage of the beautiful weather by skatin' on over to the shore in my newest Teva x JammyPack essentials. These two nostalgic brands collaborated to create a beach-worthy combo of style and fun, perfect for Spring Break, festival season, and the sweet summer ahead. I immediately fell in love with the JammyPack, because of its built-in speakers that turns any bike ride or beach picnic into a party. Plus, they come with their own matching pair of Teva Originals that keep my toes comfortable and free all day long. Our Saturday was a surreal trip back to bright and vibrant times where the tans are deep and the bikini cuts are high; the quintessential Cali life is back and I can't wait for the summer ahead. 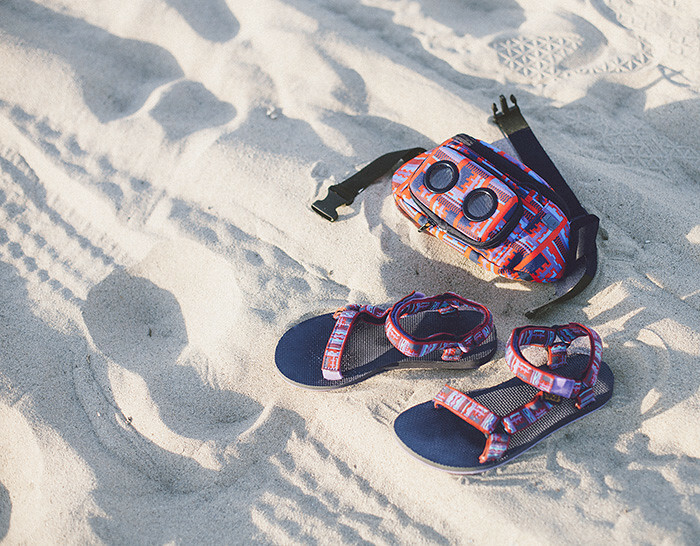 Shop the new Teva x JammyPack collaboration here for your next beach days! Love how you styled this. Came across your Lookbook profile and fell in love with each and every look. You are magnificent! Keep up the wonderful work! Oh I wish I could chill on the beach soon wearing the exact outfit you are wearing, it's just brilliant! Looking forward to a few beach days for myself. Nice sunnies!